Owning a luxury villa in Sardinia is like owning a small piece of heaven, with its breathtaking views and exquisite beauty. Let ResRei Sardinia real estate consulting assist you in becoming a property owner in the beautiful island of Sardinia. Our blog is dedicated to provide you with pratical advice and accurate information on Sardinian real estate for your next project of purchasing a house, villa or property in Sardinia. Although your future villa will have everything you dreamed of, it will not be complete without your finishing touch. Decorate your property to your taste with choices from traditional to contemporary or extravagant to simplistic designs. With imagination, you can turn your villa into an original work of art. With the vast options of creative architecture in Sardinia, you search for style that is aesthetically pleasing, unique, functional, all while accentuating the harmony between the land and the house. You also want your property adorned with an artisanal but refined look. 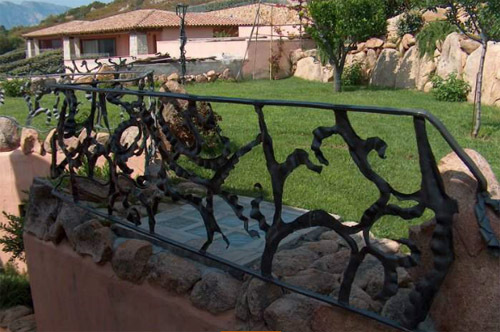 Marco Mulas, with his crafty hands and extraordinary creativity, has perfected his labors into luxurious pieces of art in iron, steel, brass, copper and bronze. Since the early age of 14, Marco’s passion of metal-working has transformed him into an artist, recognized and appreciated by some of the best designers and architects. His remarkable works can be seen throughout Italy and abroad, where he is well-known for the quality and originality of his creations. In your quest for property in Sardinia, Resrei Sardinia is here to assist you. We are a real estate consulting agency committed to bringing you only the best, in property and customer service. With our advice and guidance, you can feel secure in knowing that our information is accurate and informative. Stay tuned to our blog for more real estate news and events.